1. Don't overpack. You can buy everything you could ever need in Bali, plus a whole lot more. 3. Consider saving the moped rental for another trip. Although mopeds are the cheapest and most accessible way to get around in Bali, there are SO many injuries and accidents involving tourists on motor bikes each day in Bali. Although they may only cost you $4 a day, the pain and lost skin from a leg in shorts grazed on the concrete may not be worth it. Bicycles and Taxi drivers (which cost as little as $10 a day) are my personal favorites. If you do rent a motor bike, drive safely and slowly and wear a helmet, Please. Because I love you. 4. Barter. Always Barter. Always exchange your money into Rupiahs outside of the airport for better conversion rates, and always, always barter. 5. Use Bookings.com to find home-stays, hotels, resorts and accommodations in Bali. Air BNB is not as commonly used in Indonesia, so Bookings.com is best for quick, last minute reservations as you travel. Just make sure tor read the fine print for their cancelation policy when booking a room in advance. Trust me, they can getcha' there. ** Quick reminder, "Tidak" means "No." 7. Travel consciously. Please, please, please do not use your hard earned holiday money to support companies that exploit animals in Indonesia. Elephant Riding, Dining with the Orangutans, Luwark Coffee Tasting, photographs with animals, visiting the Bali Zoo or Bali Aquarium are cruel and inhumane for the animals of Indonesia as well as the animals of the world. There are so many ways to experience a country while keeping the animals and environment in mind. When we support one zoo/aquarium/animal tourism center, we are using our dollar to vote and saying "Yes!" I support what this company is doing and will fund them in exchange for their service. Please take time to research which activities you and your friends/family are interested in paying for before you choose. Eco Friendly & Cruelty free activities include white water-rafting, Bike tours through the rice fields, jewelry making classes, vegetarian or vegan cooking classes, raw vegan dessert classes, yoga, meditation, balinese offering making, sound therapy, mandala drawing, holistic healing and so much more! Also, if you take time to explore Bali you are bound to see animals in their wild habitat, which provides for a more more natural learning experience. Monkeys roam free in the streets of Bali, so paying to "dine with monkeys" is paying to keep these animals in captivity. Which isn't necessary or fair. Everyone should be able to experience the fresh air and breathetaking outdoor scnery that Bali has to offer. feels like my second home in many ways. Although, I've only traveled there twice. I spoke about this in my previous Bali blog post, but the even the idea of Bali alone has always cultivated a deep sense of comfort and fulfillment strongly within me. Bali has always and will always have a very sacred space in my heart. 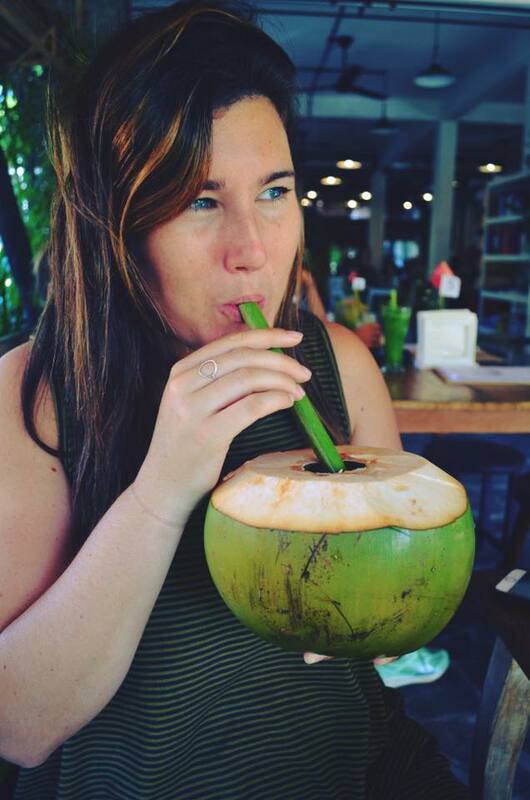 I enjoyed my summer of 2015 living in Ubud and completing my 200 hour Yoga Teacher Training at Routes of Yoga School (read here) with my best girlfriend, Lacey. The moment I land in Denpasar, Ubud is always the first place on my mind. The markets, shopping, yoga studios, temples, vegan restaurants, holistic healers, spas, crystal shops and so much more are incomparable to just about everywhere else I have traveled. Lets start with the good stuff first, shall we? The Ubud Market is a scene. Crowded, Chaotic, Loud, Unbearably Hot, Smelly (especially in the early mornings when the fish and meat is first laid out) and amazing - overflowing with any souvenir you could ever need plus 1,000 more that you don't. The Ubud Market is best in the early mornings, when the sun is finally up, the streets are swept clean, daily offerings have been laid out and the woven baskets of fragrant flower petals and fresh palm leaves are being delivered to Ubud from the North of Bali by the truckload. In the mornings (usually 7am-10am) the market sells fruits, veggies, fish, meat and spices. Although the overly crowded cages of squawking chickens and putrid smelling dried fish is quite undesirable at first (actually, always, that is always undesirable,) the market in the morning is seriously gorgeous. After 10 am or so the market completely transforms to a busy souvenir market for tourists and Ubud day trippers. NOTE * Just about anything in the market can be purchased for 30,000 RP or less (Approx. 2 USD) Be confident in your bartering skills (even if you aren't so confident at all,) and know when to walk away! Because chances are, the market vendors will be calling you back to accept your offer. I have lucked out many times in the past and been able to purchase beautiful rings, beaded necklaces, tin hangings, wooden bowls, fresh vanilla bean and so much more for only a few dollars. Some vendors (women especially) will give you a harder time at the market place and tell you they need to "profit" off of your sale - If this is the case, just take time to "window shop" and choose for yourself who you would like to support and shop from that day. The Yoga in Ubud is phenomenal. I have only ventured to a few different studios in Ubud, because once I found what I was looking for, I felt very little desire to seek out other shalas and instructors around the area. Yoga Barn and Radiantly Alive are two of the most iconic studios in Ubud. Yoga Barn is a more westernized studio that offers private retreats, teacher trainings, holistic healing and much more on their secluded piece of luscious land in Central Ubud. Classes are usually $9 USD (with weekly discount cards available) and are often held in a stunning open space shala overlooking the river and Yoga Barn's own organic garden. Radiantly Alive is smaller studio in the heart of Ubud (just about 3 minutes down the road from the Ubud Market.) Similar to YB, Radiantly Alive also offers workshops, Teacher trainings and group classes. This summer I completed my 35 hour Fly High Yoga Teacher Training at Radiantly Alive. The food in Ubud is 90% of the reason why I go there. Never have I ever been to a town that offers as many incredibly delicious vegan and health foods as Ubud does. Where to begin..
Ah Yes, Alchemy Ubud is hands down one of the best restaurants I have ever had the pleasure of dining at ever before. Although this restaurant is entirely Raw Vegan, You wouldn't have guessed that they don't use a stove to prepare the food. Their 12 foot long salad bar is something that must be experienced in person to appreciate and understand. Their desserts are also next level. If you go to Alchemy you must get two slices of the Bannoffee Pie. One for yourself, and one to be put on dry ice and mailed to my door in Hawai'i. Warung Sopa is one of the best not-so-secret restaurants in Ubud. This entirely vegetarian (mostly vegan) restaurant is absolutely incredible and insanely cheap. High quality home cooked food at cheap prices. Order their Kitcheree ("No Ghee Please!") and 17 pieces of their vegan tomato quiche. You're welcome. Dayu's Vegetarian Warung is just a few feet down the road from Warung Sopa and is a serious gem. Also exceptionally cheap, and homey, with casual table and floor seating and a back-packer friendly vibe. Pacha Mama Vegetarian Restaurant is another must! Delicious food and amazing tempeh tacos. On the southern tip of Bali's peninsula, down the long winding roads, outside of the busy inner cities and among the dramatic sea cliffs, resides Uluwatu in all of its glory. If you surf, swim, SUP, kayak, sun bathe or just are there for the beachfront scenery - I can guarantee that Uluwatu will not disappoint. We spent a week in Uluwatu enjoying the surf, going for sunset runs to Single Fin bar to catch the sunset, soaking up the sunshine and sweating out the salt water on our mats at Yoga Searcher Bali. The diving in Amed and Tulamben was incredible. I read online that the diving in Amed was best in Bali, and although I can't testify to that just yet (still have many reefs in Bali that I have not yet dove on,) I did experience my first ever swim with a MolaMola fish which was seriously remarkable. I also spent time diving on wrecks with reef sharks and octopus. I dove with Bali Adventure Divers and Bali Dive Resort. Via fastboat ferry (The more expensive and safer boats are made of Aluminum!) we traveled from Padang Bai, Bali to Gili Air Island. 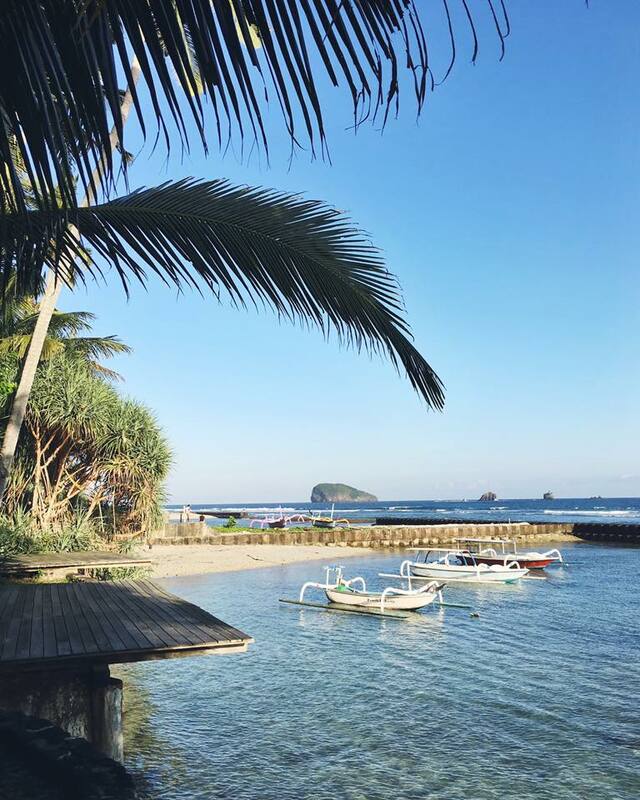 The Gilis are a string of three small islands off the coast of Lombok. Gili Meno is know for its white sand beaches and honey-moon crowd, Gili T for it's party and backpacker scene, and Gili Air for its small island feel - where no cars or motorized vehicles are permitted, but rather bicycles, electric bikes and horse carriages. Please MAKE SURE TO PACK LIGHTLY when traveling to the Gilis, as ferry boat's luggage packing techniques are questionable and more luggage means more weight. The less you have, the easier it is to carry around the island. Please do NOT pay drivers in horse carriages to transport you around the island. The horses are overworked, underfed and given very little "rest" time in between long days running on rock, sand and dirt. Bikes are available everywhere on the island and can be rented for as little as $3 a day. Also, the shopping on Gili Air isn't great. Quite overpriced and most certainly targeted at tourists. So save your money for the more pricier veg friendly food and humane, eco friendly actives such as free diving, snorkeling, glass bottom boats or Fly High Yoga. I spent three days on Gili Air completing my free diving certification with Free Dive Air and absolutely loved it! Highly recommend to anyone interested in learning more about open sea diving and using our bodies naturally to push boundaries. Captain Coconuts - Get the Vegan Nachos. Thank you. You're welcome. Also, don't forget to bring a suit when you dine! The owners are so sweet and usually invite you to hop in the cool if you'd like to cool down after you feast. Mowie's Bar - Vegetarian and Vegan food (Desserts included.) On the beach. Doesn't get much better than that. Pachamama Cafe - A little pricey but a whole lot of goodness for your buck. Rad atmosphere, hidden location off the beaten path and incredible food and smoothies. Captain Coconut's Hanging Bed Hostel - Must I say much more? For those on a budget and looking forward to meeting with fellow backpackers and travelers alike. Also attached to Captain Coco's amazing vegan and vegetarian restaurant.... so... You should probably stay here. Dwi Inn - Small, clean, cheap and near the beach. Wifi is rubbish but Hadi the owner is wonderful and very accommodating. Love that these cottages are located outside of town and in a more secluded part of the north/east side of Gili Air. After a very questionable five hour boat ride from the Gilis to Bali, my mother and I finally arrived back in Ubud with friends to enjoy our last few weeks surrounded by the rice fields, markets and yoga studios. Unfortunately, at this time I fell ill with dengue fever and was bed ridden for four days. Once I was feeling better and able to leave my homestay, I got busy. Here's what I got up to in Ubud. Sacred Colonics at Alchemy Holistic have seriously saved my life. Last summer, I was sick with a bad case of Bali Belly and trust me when I tell you that these colonics were my ONLY cure. The staff at Alchemy Holistic is the best of the best. Professional, experienced and determined to make you feel as comfortable and relaxed as possible. If you're going to pay anyone to shove anything up your you-know-where, you want it to be a hydro-colonic therapist from Alchemy Holistic. I pinky promise. Ayurvedic Healers and Chakra healers are scattered throughout central Ubud. I highly recommend doing some research and looking into which healer you'd like to work with. Hour long consultations usually start at about 250,000 RP ($19 USD) and may help you to learn something you didn't already know about your health, energy force or lifestyle. Massages and spa therapies throughout Bali are also a must. Especially in Ubud, with 60 minute massages starting at $7 USD. If you're a more conscious spa goer, make sure to speak to your masseuse before your treatment begins and confirm that you wouldn't like any lotions or creams (most containing milk or other animal products) used, but rather coconut or lavender oil. Also take a moment to check ingredients in things like face masks or body scrubs to ensure that no honey, milk or yogurt is being used. Fortunately, many scrubs and masks are already vegan and comprised of natural ingredients such as sea salt, turmeric, brown sugar or essential oils. If you don't feel like risking it, feel free to bring your own lotions/creams/oils and ask the masseuse to use them during your treatment. Visit Ubud's Rice Fields. Although they're quite touristy, the view is unbeatable. I recommend hiring a driver to take you to the rice fields in the early morning on a weekday. Less crowds of tourists equals better photographs, of-course. Wear walking shoes and bring small bills for the donation boxes as you rice up the terraces. Visit Baith Els Christian Home for Children in Klungkun. Message them via Facebook and ask to set up a time for a visit. If you or your family are able to bring donations (of food, cleaning supplies, clothing, school supplies etc.) please make sure to speak to Baith-El's in advance and ask if there is anything in particular the children need at this time. Making a trip to this orphanage will not be a mistake. The children are insanely sweet and so heartfelt and absolutely love to have visitors stop by. If you're interested in setting up a visit but want to learn more, please feel free to email me personally. You will not regret it. 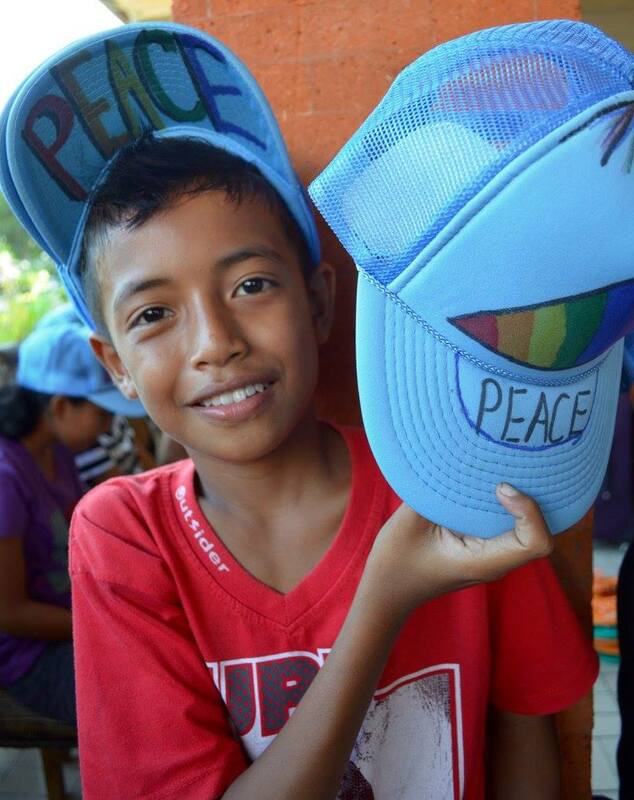 This summer, My amazing mamma and her 5th grade art students from Long Island, NY custom designed hats for the 118 boys and girls at Baith-El Christian Home for Children. She brought them in two suitcases all the way from New York to Hong Kong to Bali. We spent the afternoon handing out over 100 pairs of rubber slippers, 125 hats (which clearly were a big hit) as well as clothing, food and notebooks. The children are so ridiculously sweet and gracious, holding each one of our hands and touching them to their forehead as a sign of respect. And a very special Mahalo to my incredible mother and sister for being the most amazing travel partners I could have asked for. I am very fortunate to have been able to experience so much of Indonesia with you both by my side. The most patient, considerate, relaxed and adventurous travelers in all of Bali, I love, love, love you!